I know not everyone likes creamy soups like this one. 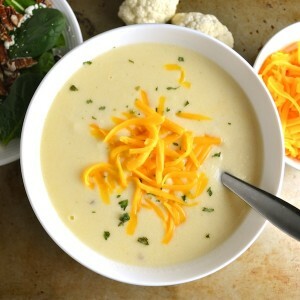 Butternut squash soup is another example. But I love them. I love them with some crusty artisan bread to dip and a fruity side salad. I love them in a big bowl as the main dish or in a small bowl as an appetizer. And I love how easy they are to make. So this is a copycat recipe from Zupas. And I made a few changes that I think make it even healthier. Have you been to Zupas? It’s a really good soup and salad cafe. Sad story. I did some writing and editing for Zupas once upon a time. I was pregnant with my first baby while working for them. And sick. Like so nauseous. So I sat at a desk in their corporate headquarters nibbling on saltine crackers and writing about food. And I couldn’t eat at Zupas for a couple years after that. But now I can! And I love their food again. And I especially love this soup. And it’s so easy to make at home. So there’s a happy ending to that sad story. I like to use butter from pasture-raised cows like this Kalona Super Natural butter and cheese from grass-fed cows like this Organic Valley Raw Sharp Cheddar Cheese. I also use raw milk that I buy from Real Foods Market and homemade chicken bone broth. 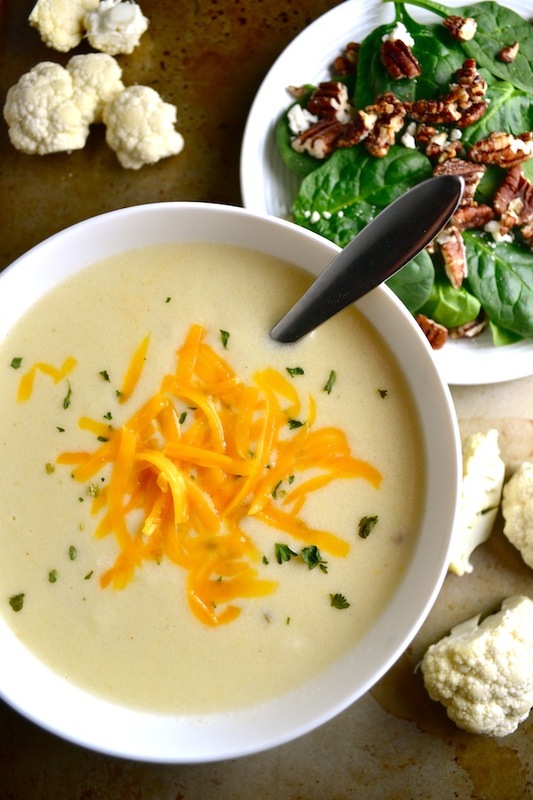 With these full-fat, nourishing ingredients and fresh onions and cauliflower, this soup is wholesome and delicious. If you don’t have an immersion blender, transfer the soup to a regular blender in a couple different batches. You’ll need to remove the center part of the blender lid to allow steam to escape. And don’t fill the blender very full and make sure you blend it on a really low setting. As you can see…it’s easier to use an immersion blender. But either will work. 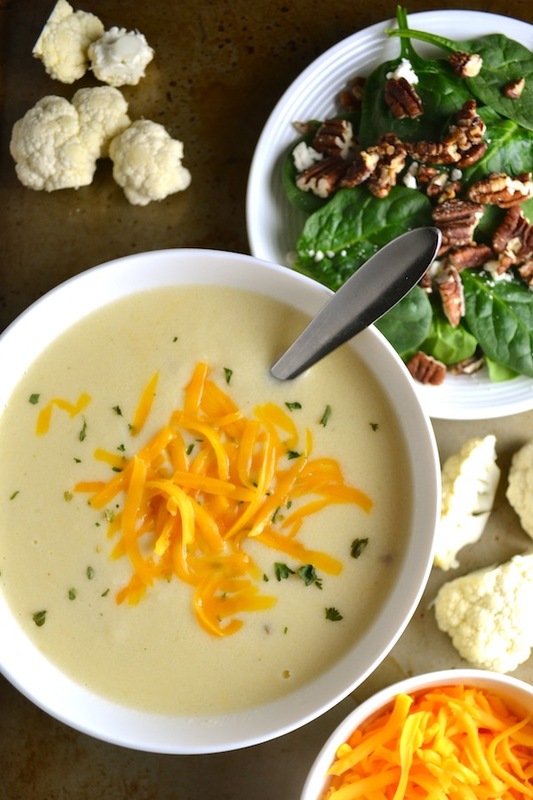 Enjoy this yummy, creamy, scrumptious soup! Heat a large pot over medium-low heat. Add the chopped onions and cook until translucent, about 5 minutes. Add the flour and let it cook for three minutes, stirring occasionally. Slowly stir in the milk, water, and chicken broth. Add the cauliflower and heat until boiling. Reduce the heat to low and simmer, covered, until the cauliflower is tender, about 15 minutes. Using an immersion blender, blend the soup until all the cauliflower chunks are gone. Add the mustard and cheese and stir until melted. Serve hot with a garnish of cheese on top.